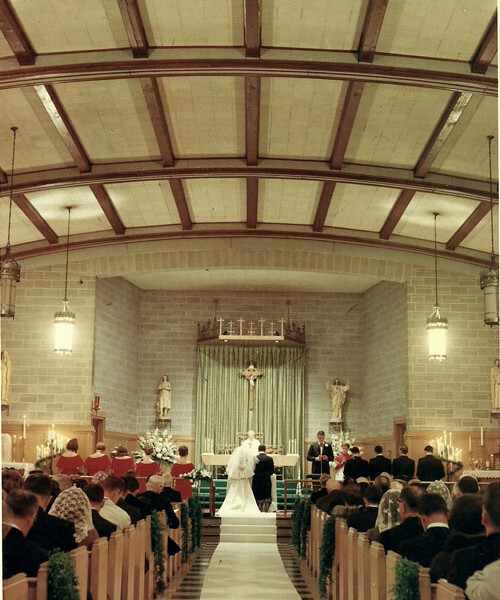 St. Joan of Arc Parish on the North Shore of Chicago was designated a new parish by His Eminence, Samuel Cardinal Stritch, the Archbishop of Chicago on July 2, 1951, and appointed Rev. Francis P. Galvin as founding pastor. The parish was named after the fifteenth century heroine of the Hundred Years War who was canonized a saint. The first Mass was offered in the College Hill Public School Hall. In October, the new rectory was purchased at 9257 North Drake at which Mass was offered in the rectory chapel. The SJA Women’s Club was organized in March 1952 and Father Galvin reported that 181 families had registered by September 1952. A month later, the cornerstone of the Church and School building was laid. The school opened in September 1953 with an enrollment of 143 students K-6th with four Sisters of Mercy comprising the staff, Sister Norella as principal. Unfortunately, Father Galvin died of a heart attack in 1954, two weeks prior to the dedication of the church and school on June 13, 1954. Father Leo Flynn was then assigned to the pastorate. At that time, there were 200 families registered in the parish. The new church and school building housed a church, cafeteria, kitchen, auditorium, classrooms, principal’s office, library and living quarters for the Sisters. In August of 1955, ground was broken for the convent and rectory on Lawndale Avenue. The Sisters moved to their new home the summer of 1956. Eight years later, in September 1964, a new addition to the school was opened that included a gymnasium, library, additional classrooms and administrative offices. At that time, 448 students K-8th grade were enrolled. On Sunday morning, March 16, 1969, Father Flynn suddenly passed away and was succeeded by Father John McMahon. Father McMahon was pastor of St. Joan of Arc until he retired in February 1984. Father Bernard White then became pastor of the parish. During this time, the Sisters of Mercy withdrew from the school in June 1971 and the Sisters of the Living Word rented the convent. 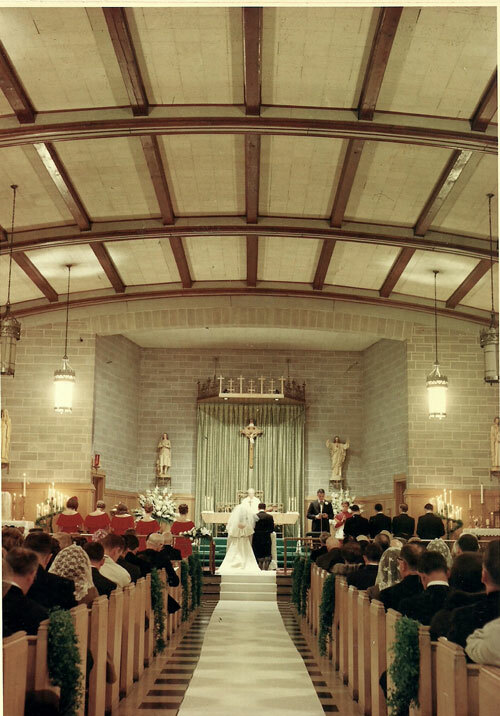 In 1988, Father White retired and Father James Moriarty became St. Joan’s pastor for 6 years. Also coming to the parish was Father Matt McDonald, former Firemen Chaplain, who resided in the rectory and offered Mass until 1998. Father James Barrett followed Father Moriarty in 1995 serving St. Joan of Arc for 10 years, during which a capital campaign was successfully completed: renovating the interior of the church, the school auditorium and restructuring the church/school parking lot. Father James Kehoe followed Father Barrett in 2006 and retired in June of 2012. Father William Vollmer followed Fr. Kehoe and was pastor through June 2014. Father Dan Costello became our current pastor on July 1, 2014. St. Joan of Arc has been and continues to be a strong, cohesive parish and school. The culture of our parish is family-oriented, faith-filled and service oriented. We promote an active faith in God and maintain strong values of our Catholic faith. Located in a delightful neighborhood in Evanston/Skokie suburbs of Chicago, we are a special parish!